A newly translated ancient Babylonian clay tablet dating to 1,700 B.C. reveals new details of the global flood story. Dozens of clay tablets tell the tale of the one righteous man and his ark full of animals, but this one tablet is the only one that actually describes the vessel. The tablet in question was owned by RAF veteran Leonard Simmons who got it somewhere in the Middle East when he was serving there right after the war. He had a chest full of tablets, pottery, seals and various other artifacts that he had bought at bazaars and whatnot, but although he showed them to experts, they all dismissed them as commonplace. 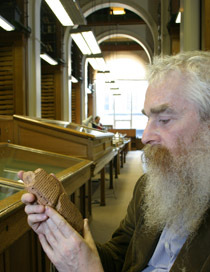 When he passed away and his son Douglas inherited the collection, he took the tablet to British Museum cuneiform expert Dr. Irving Finkel. Dr. Finkel is one of the few people in the world who can sight-read cuneiform and he knew at first glance that this was no common clay tablet. Finkel’s research throws light on the familiar Mesopotamian story, which became the account in Genesis, in the Old Testament, of Noah and the ark that saved his menagerie from the waters which drowned every other living thing on earth. It closes with Atram-Hasis telling the builder he’s leaving behind to drown to make sure he caulks the door behind Atram-Hasis when he last enters the boat. Round bundle boats called quffa are still found on the Euphrates today, very similar to ones found on Assyrian wall carvings from the reign of Ashurnasirpal II (883–859 B.C.). In the 20th century some were made that could transport 16 tons of grain and dozens of animals, so the idea of round coracle ark is not as crazy as it may sound.